Where to begin! Italy will forever have a tiny piece of my heart! My Mom's family is from Italy and my Dad is from Portugal. European culture is just in my blood! I am very fortunate to have traveled to both countries when I was 16. It was such an amazing experience. But this time was different. Being older and married, I now have more of an appreciation for the places we visited! We visited Italy in September of 2017, which in my opinion was the perfect time. The weather was just right and it wasn't as busy as July and August would of been. 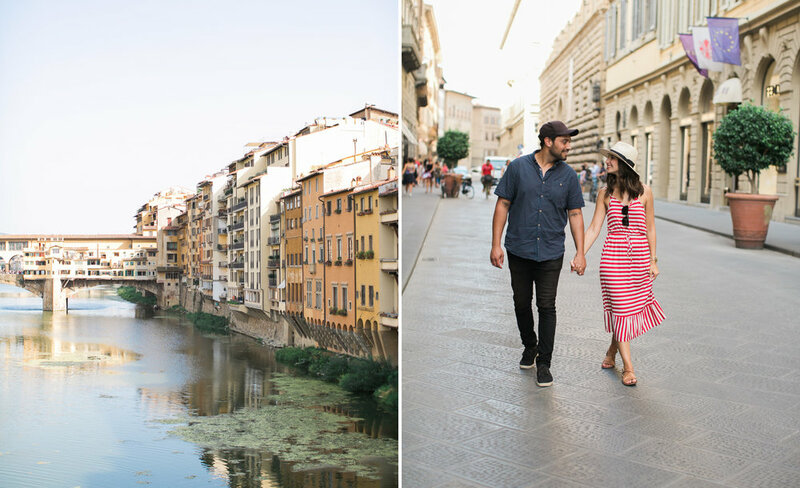 We broke our trip down by two different cities : Florence (Firenze) and the Amalfi Coast. First stop was Florence! We flew into Rome and took a train straight into the city. Our Airbnb was right in the heart of the city! Click the link if you want to see which one we stayed at! : https://www.airbnb.com/rooms/8108550 . We were able to walk from the train station to our loft apartment. 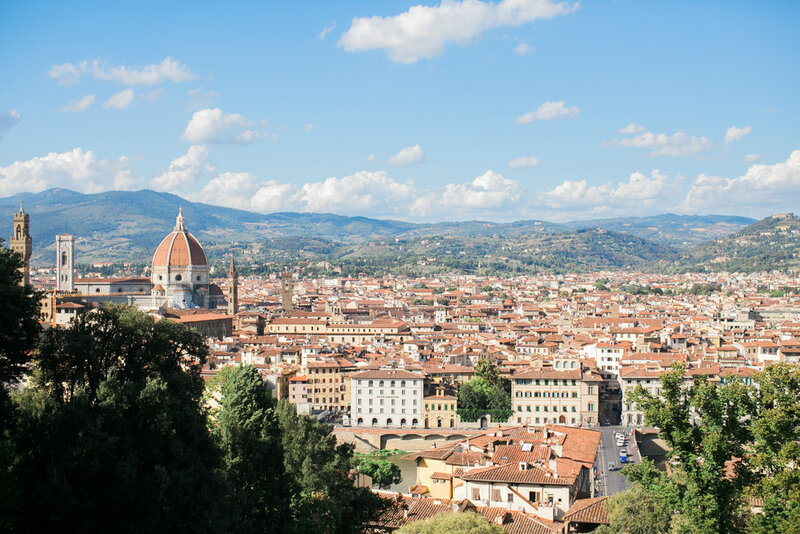 Just a 5 minute walk to the Piazza Del Duomo and Ponte Vecchio. Since I'm more of a city girl, Florence was one of my favorites! Our days consisted of walking, exploring, more walking and gelato! Every morning we stepped outside and walked across the street to the cutest cafe. We had our fresh fruit, hot espresso and prosciutto sandwiches. All the shopping you can imagine was nestled into these tiny streets of Florence. Florence also had some of the best restaurants I've ever been too! L'Osteria Di Giovanni served these mini fried dough balls before dinner. I think we ate there twice for that reason. Ha! And one of our favorite restaurants was Trattoria 13 Gobbi. They are known for their famous cheesy rigatoni dish. It's also where I had the best pasta fagioli of my life! If you don't know what that is...you're missing out! I would love to go back there some day! Some of our favorite memories of Florence was walking around at night. Most tourists leave for the day and the crowds die down. At night, the city comes alive. People are out on the streets eating gelato and listening to live music being played in the square. One of the day trips we did in Florence was to Venice. We were able to take a train straight in Venice. It was super convenient. 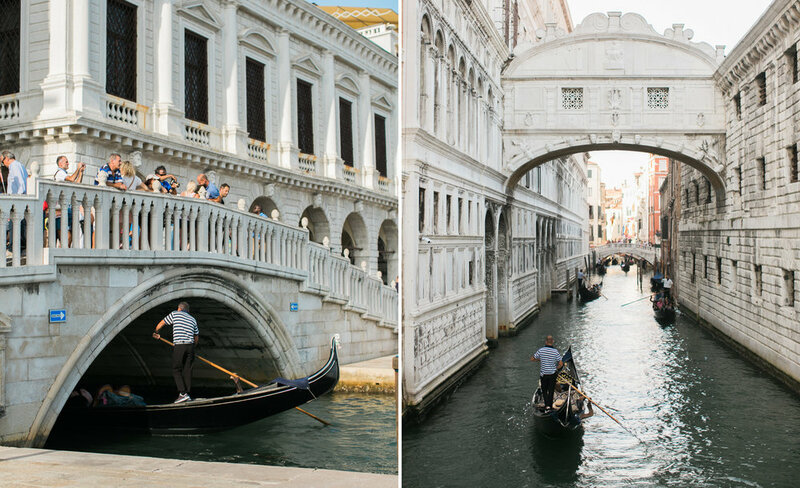 Everyone had told us mixed reviews about visiting Venice. How it was really dirty and super crowded. I am so glad we didn't listen to them and went anyways. It was probably one of the coolest places I have ever seen! You walk out from that train station to see a city built on WATER! No cars, just water canals. I mean, how amazing is that!? Every alley we took, turned into a hidden gem we discovered. I wish we had the chance to stay over night to see everything, but our one day was still worth it. 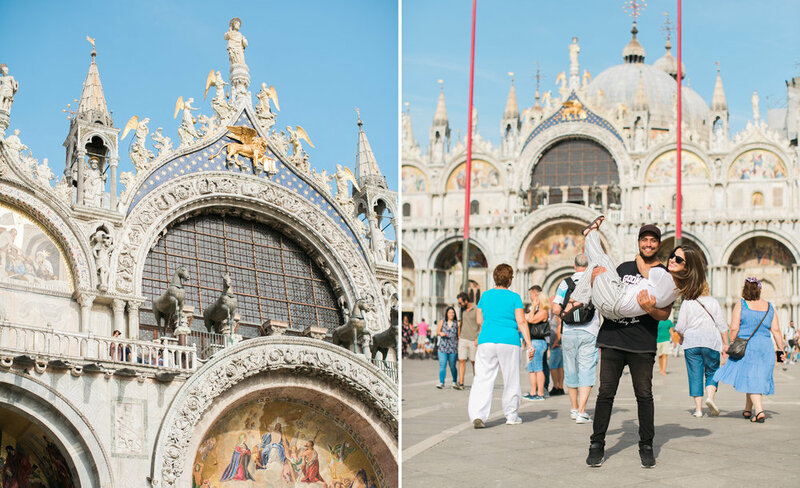 We knew we wanted to see the Piazza San Marco where the St. Marks Basilica was. To get there, we followed these tiny wooden signs that were nailed above each alley way. There was either an arrow that pointed left, straight or right. Turn after turn, alley after alley...and all of a sudden...you're there! The square is HUGE and so open! We just stood in awe for a few minutes to soak it all in. 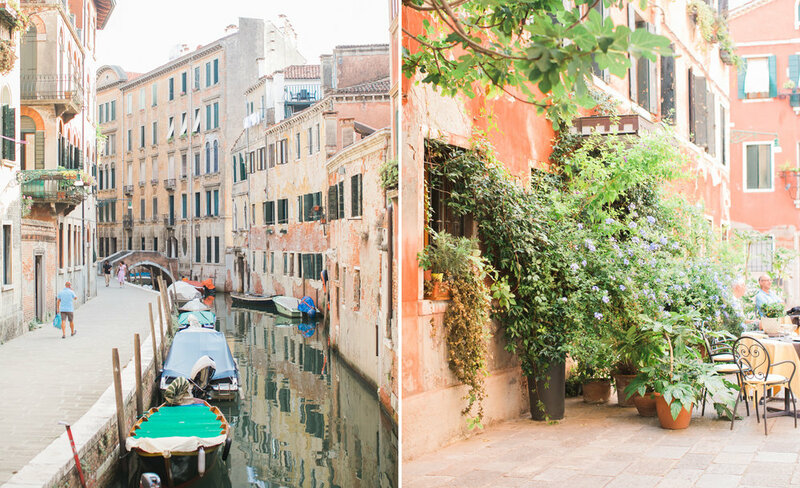 I can go on and on about the beauty of Venice, but it is something you will just have to visit in person. There is nothing like it! Next stop was down to the Amalfi coast. We took a train from Florence into Sorrento. Then we had a driver bring us to the house. If you want to see where we stayed, click HERE! : https://www.airbnb.com/rooms/4821310?location=Fuore%20amalfi%20coast&s=gQcBzrOd . The first picture below is Vic standing on the patio from the house. That was our view for the next four days! We stayed in the TINY town of Fuore. It was nestled in between Amalfi and Positano. When I say this town was tiny, I mean it was tiny! It was a totally different feel from leaving Florence. This was our relaxing part of the trip. To get to the closest restaurant or market, we had to walk a good 20 minutes up the side of a cliff! To give you a perspective of what small town life was like, let me tell you about Antonio. Antonio was this tiny old Italian man who ran a convenience store in Fuore. Now it was the ONLY convenience store in the town. It had your typical snacks, cigarettes, magazines, etc. We had just made our 20 minute walk to it hoping to find some food, but it only had small snacks. So we asked Antonio where we can get a small bite to eat around here. He said, " Hold on. What are you looking for?" He walks across the street to the grocery store, picks up a few ingredients, heads back, and makes all of us some fresh prosciutto, mozzarella and tomato sandwiches! He was also the same man who offered to drive us AND pick us up in his van to the local beach! He did everything! I swear, you would never find or trust anything like that in the United States. We will never forget our kind and generous friend, Antonio! One of my favorite things we did was a tour of the coast. 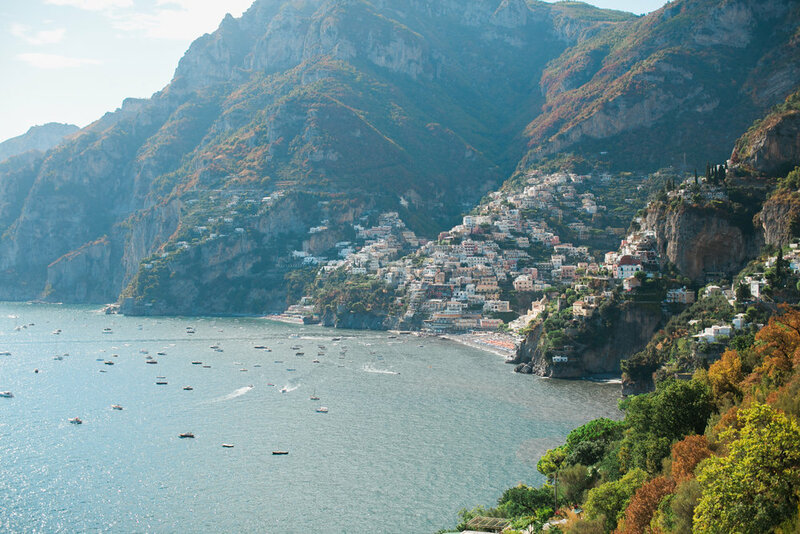 We visited the towns of Minori, Ravello, Amalfi, and Positano. Everyone raves about Amalfi and Positano, but Minori and Ravello were my absolute favorites! Visiting Sal de Riso pastry shop in Minori was like visiting an art museum for food. It is one of the most famous pastry shops in the world! When you walk in, you know why. The Amalfi Coast was filled with beautiful scenery, art, pottery, boutiques and a small town feel. During our tour, we had a private boat that picked us up from Amalfi and brought us to a tiny town named Conca dei Marini. Never in my life have I ate lunch with a view that beautiful! We definitely preferred the smaller towns than the major tourist attractions. Last stop of our vacation : Rome! I'm not going to lie, Rome was my least favorite. After spending the last 4 days by the coast, Rome felt like the European version of Time Square in New York. It was so beautiful, just VERY crowded! We went to the Spanish Steps, the Fountain of Trevi and the Colosseum. Our hotel was located near the Metro, so it was very easy to make our way around the city. 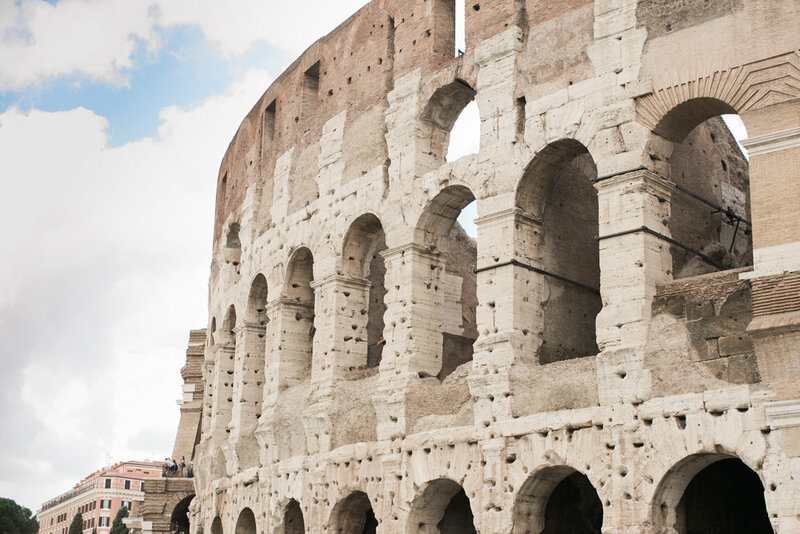 We only stayed in Rome for two nights so we had to cram a lot of things in a short amount of time. We ate at some fantastic restaurants, visited some of my cousins that I hadn't seen since 2006, and even managed to squeeze in a mini photoshoot! Of course the photographer in me wouldn't let my husband get off the hook that easily when in Italy. And the best part...my DAD took the photos for us! I showed him where to stand, fixed the settings myself, and told him what to do. And he did pretty good! And there you have it! Our entire trip crammed into one small Blog Post! I miss it already! I even told Vic I can picture ourselves living there for a year! And I'm already dreaming of the next time we can go back. 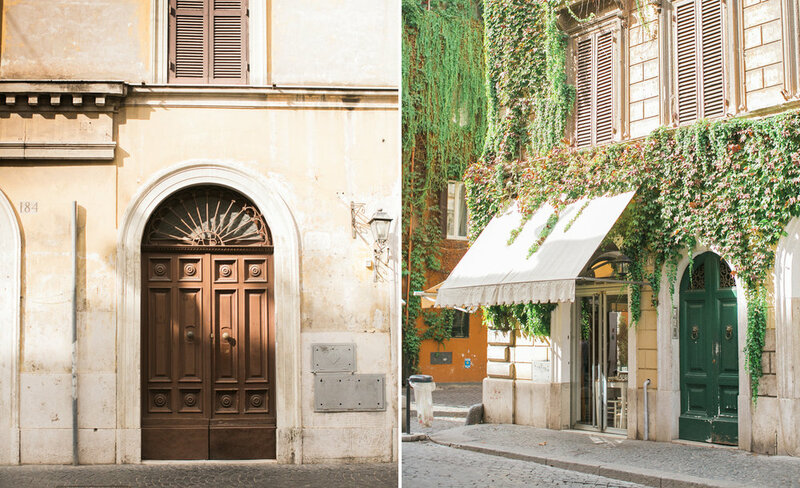 If you are planning a trip to Italy and need some recommendations, I'm your girl! I would love to grab coffee and talk about one of my favorite countries :) Hope you enjoyed!